This vast 4 Star 3 bedroom condo sleeps up to 10 guests. The perfect rental for groups and families! This stunning three-bedroom, two-bathroom condo canaccommodate up to 10 people. The hardwood flooring, rustic woodwork and stonefireplace create a cozy, inviting atmosphere in this mountain residence. It'sspacious and bright, with ample windows that offer an uninterrupted view of thelake and mountains. The large kitchen is equipped with everything required toprepare meals for all the guests. In the living-room, you'll enjoy socializingin front of the fireplace, lounging on the two high-quality leather sofas, andadmiring the lake view. The rooms are comfy to ensure a great night's sleep.The master suite has a queen-size bed, private bathroom and large balcony witha view. The second bedroom is furnished with a queen-size bed, and the thirdbedroom with two twins. Air conditioning, heated tile flooring, four TVs andwireless high-speed internet add to the guests' comfort. 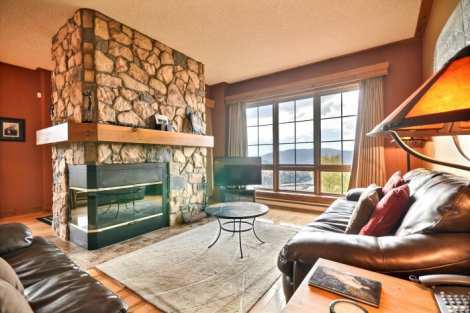 We had family reunion and chose one of the Equinox unit which is facing the Lake Tremblant; the scenery is amazing and the condo unit that we chose was beautiful, clean and include all the kitchen utensils, dish washer, washer and dryer and all the detergents. All our family members love the condo and we had a great time to stay in this unit. I will recommend this property without reservation. I can't wait to come back for another get together.